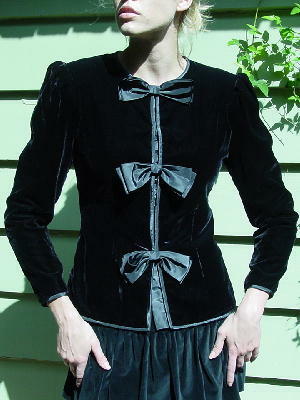 This vintage black jacket is made of 68% acetate, 16% nylon, 14% rayon, and 2% acrylic. There are 3 black bows which have eye hooks and there are 2 snaps in between the bows. It's fully lined, has shoulder pads, and there is a finished trim around the neck, down both sides of the front, around the bottom hem, and the sleeves. It's a very soft glossy velvet. It's very classy and elegant and was used in a photo shoot over a long black velvet dress and Giorgio Armani pumps.